Media Contacts: FHC Staff Niki Green (877) 979-3247, Attorney Steve Tomkowiak (248) 543-1600. A copy of the filed complaint is available upon request. Ann Arbor – The Fair Housing Center of Southeast & Mid Michigan (FHC) initiated a housing discrimination lawsuit against Group Five Management Company and TG Properties LLC, the owners of Randolph Court Apartments in Ann Arbor, MI.Since age 4, Sarah Tankson has suffered from a debilitating neurological disorder known as dystonia. 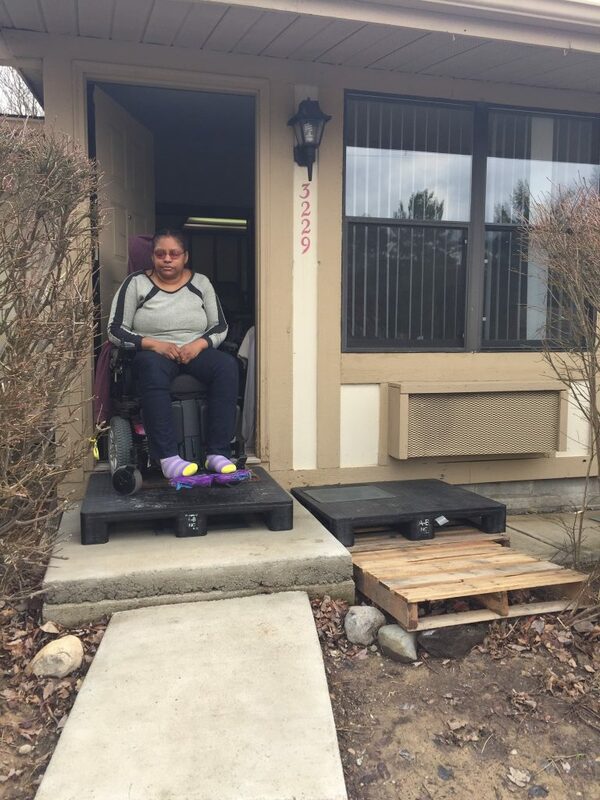 Prior to signing a lease at Randolph Court at the end of 2016, the manager stated in writing that Sarah Tankson would be able to install a wheelchair ramp upon move in, as Ms. Tankson uses a wheelchair and the home she was planning to rent had three steps from the sidewalk to the front door. According to the lawsuit, Ms. Tankson then contacted the FHC in January after Randolph Court Apartments management told her that “she and health aide (Karen Kelsey) must remove [her makeshift ramp] and stow it away after each use.” Ms. Tankson had been using cardboard and milk crates as a temporary yet unsafe solution to enter and exit her home. Thereafter, management sent a letter stating that Ms. Tankson has “been leaving trash” around the patio area of her unit and warned that she would be assessed fees unless she removed such trash. Ms. Tankson and her aide complied by removing the makeshift ramp materials, thus forcing Ms. Tankson to remain shut in her apartment or crawl out of her unit on days she required outside care. Ms. Tankson missed many doctor’s appointments as a result of being unable to safely leave her apartment, which caused the symptoms of her disability to worsen. This dire situation forced Ms. Kelsey to redouble her effort to locate a contractor to install a temporary, removable wheelchair ramp. These efforts received media attention from WXYZ Channel 7 in Detroit. 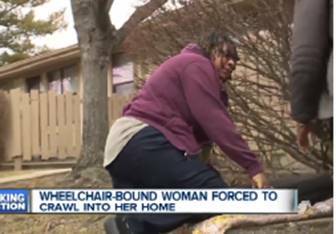 February 21, 2017: Handicapped woman with no ramp forced to crawl to enter her home. Thanks to the televised news coverage, a volunteer contractor agreed to construct and install the ramp, and raised contributions to cover the cost of the ramp. Randolph Court management, however, would not allow the ramp until it received and approved the plans. The Fair Housing Center worked with Ms. Tankson and the contractor to provide the plans to Randolph Court management on February 28, 2017, and asked for written approval by March 1, 2017, as the contractor was ready to install the ramp. No response was given. Instead, management contacted Ms. Tankson on March 2, 2017, stating she could have a temporary ramp installed only if she moved into a different apartment unit, because they did not want any bushes removed or to have the ramp go across the walkway in front of her home. Randolph Court management continued to delay the installation of the ramp by refusing to grant approval, even going as far as to turn away the contractor after he came out to install it. The FHC contacted Group Five Management one last time to inform them that Ms. Tankson’s request for a ramp at her unit did not pose an undue burden on Randolph Court and that the Federal Fair Housing Act requires housing providers to grant permission for wheelchair bound tenants to install temporary ramps to make the entrance to their units handicap accessible. The Fair Housing Center never got a response. WXYZ Channel 7 Detroit, in a follow up broadcast, reported on the refusal of Randolph Court management to permit the installation of the temporary ramp at Ms. Tankson’s unit. 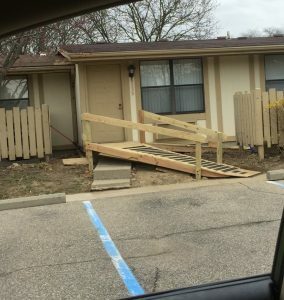 March 7, 2017: Handicapped woman blocked from building her own wheelchair ramp. FHC Cooperating Attorney Steve Tomkowiak filed the lawsuit on behalf of Ms. Tankson. The case, filed in U.S. Federal District Court on March 15, 2017, has been assigned to the Honorable Sean F. Cox. After the filing of the lawsuit, Randolph Court management permitted the ramp to be installed. March 30, 2017: Disabled Ann Arbor woman gets ramp at home built after WXYZ takes action. The lawsuit continues pertaining to the injuries and emotional distress damages to Ms. Tankson. Sarah Tankson, pictured with her make-shift ramp. Photo taken by FHC Staff Niki Green. WXYZ Report of February 21, 2017. Screenshot from video. The completed ramp outside of Ms. Tankson’s apartment. Photo taken by FHC staff Niki Green. The Fair Housing Center of Southeast and Mid Michigan, founded in 1992, actively protects the civil rights of those who are discriminated against in the rental, sale, or financing of housing through investigation, education, advocacy, and legal action. The FHC takes an average of 150 complaints each year from its eight-county service area – Clinton, Eaton, Ingham, Jackson, Lenawee, Livingston, Monroe, and Washtenaw counties. This entry was posted in About FHC, News, Press Releases and tagged Ann Arbor, Channel 7 Detroit, disability, Disability Rights, Fair Housing Center of Southeast & Mid Michigan, Group Five Managment, Ramp, reasonable accommodation, reasonable modification, Sarah Tankson, Steve Tomkowiak, WXYZ. Bookmark the permalink.